It was officially announced Wednesday that Trump will nominate South Carolina Gov. Nikki Haley to serve as ambassador to the United Nations. Haley's supporters are likely pleased that the appointment will elevate her and give her an even higher profile on the national stage. 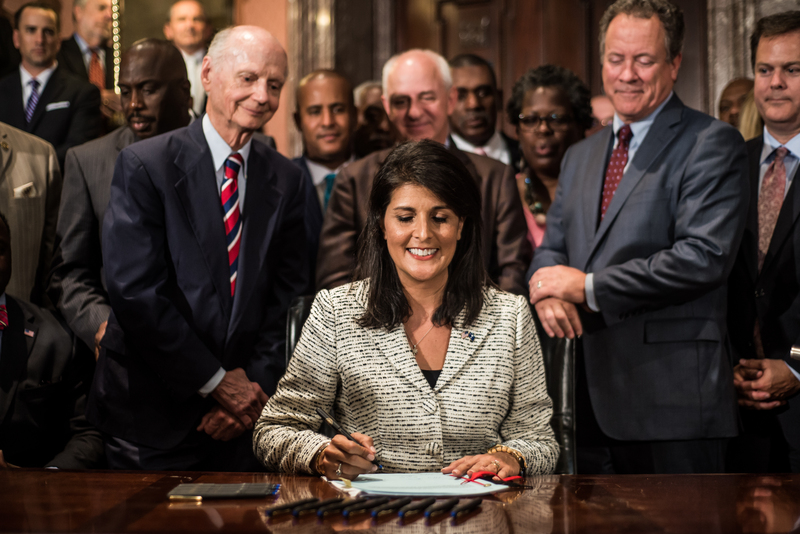 A rare woman of color who is a Republican elected official, Haley has been considered a rising star in the GOP. In fact, some hope Haley will one day take the White House, and even with the nomination, Nikki Haley could still run for president in 2020. There are no guarantees that the president-elect will even decide to seek a second term in office. Although Trump tweeted Tuesday about choosing "the people who will run our government for the next 8 years," he'll be a not-quite-spritely 74 in 2020. Many, like documentarian Michael Moore, even doubted if Trump actually wanted to win. In that case, Haley might even be able to run with his blessing, though of course she would need to resign from her position at the United Nations (assuming she is confirmed by the Senate in the first place). Alternatively, she could step down from her post in 2018 or 2019 and begin campaigning for a primary challenge to Trump. Primary challenges against incumbent presidents have been uncommon in recent years (the last was Pat Buchanan against President George H.W. Bush, in the 1992 election) but there's certainly a precedent for a primary challenge, should Haley decide to run. Moreover, she may not feel as if she owes him anything. Haley has already disagreed with Trump outright on many major issues; and as with many of his potential appointees, Trump has a history of conflict with Haley. Haley gave the Republican response to the State of the Union earlier this year, and many interpreted it as a rebuke of Trump's anger and anti-immigrant rhetoric, particularly given that Haley herself is the child of immigrants. "No one who is willing to work hard, abide by our laws, and love our traditions should ever feel unwelcome in this country," she said. Haley called the 2016 election "embarrassing" and said it "turned her stomach upside down" but indicated that she voted for Trump. If Haley's frustration with Trump's rhetoric and policies continues during his administration, Trump may have just added a valuable piece of experience to the resume of the woman who might win the White House next.